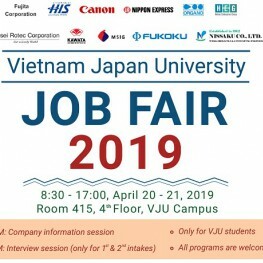 On 20, 21 April, VJU will organize Job Fair 2019 in which many Japanese companies will come and have interviews with VJU students. UNIQLO is a clothing apparel company, which was originally founded in Yamaguchi, Japan in 1949 as a textiles manufacturer. Now it is a global brand with over 1000 stores around the world. Redefining clothing, with a focus on quality and textiles which has been unwavered since the company’s origins in 1949. H.I.S. 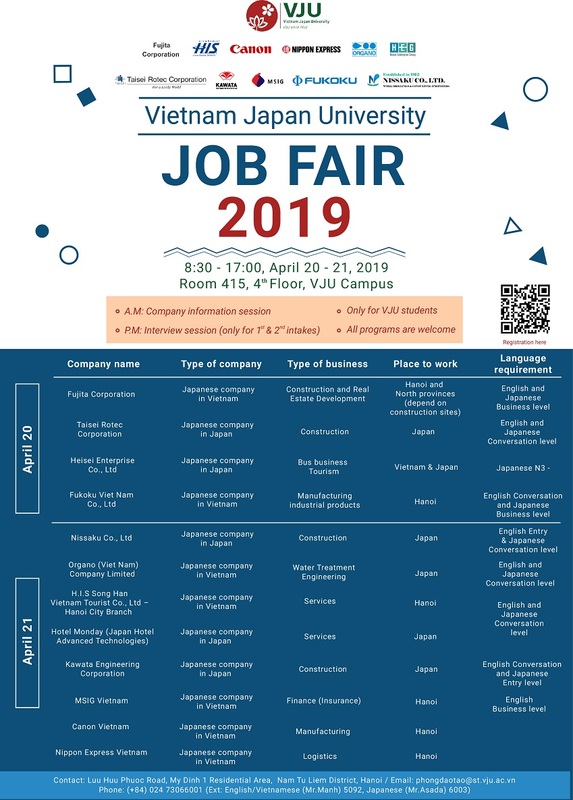 Japan was established in 1980 with 296 domestic branches and nearly 300 international ones in 71 countries in the world and Song Han Vietnam Tourist Co., Ltd was established in May 2006. With leading Japanese quality, H.I.S Song Han Vietnam provides tourists with professional tourism services which can be named operating full package of domestic and international tours for Vietnamese people and tourists coming to Vietnam, international and domestic air tickets, supporting services: hotels, restaurants, and spa…, vehicles for rents and designing tours in according with tourists’ requests. There are 3 branches located in Ho Chi Minh, Ha Noi and Da Nang, hoping to bring tourists unforgettable experience of traveling. Canon Inc., a leader in the fields of professional and consumer imaging equipment and information systems. Nippon Express is a Japan-based logistics company with a global reputation. They began working as a logistics provider more than 80 years ago, and our ground transportation business dates back to 1872. Organo is the leading and pioneer company in water/ waste water treatment business in Japan since 1946. Established on 1/12/1992, the business operation details are: Chartered Buses, Shuttle buses, Omnibus, Lift equipped buses, Travel agency and equipment maintenance, Fitness club, Day care facility and lodging services. Combining global and local best practices, the core subsidiaries and affiliates of MSIG Holdings (Asia) Pte. Ltd.across ASEAN, Hong Kong, Australia and New Zealand, have been providing general insurance solutions for more than 100 years. As an established leading insurer with a long-term perspective, they aim to offer insurance solutions that are effective, efficient and simple to understand; delivered with active and sincere service. Fukoku Co., Ltd. is the world's largest wiper blade rubber company. In addition to wiper blade rubber, Fukoku manufactures seals, anti-vibration products and Ultrasonic motor. Nissaku Co.,Ltd. was founded in 1938. The Company's line of business includes providing wqater well drilling services. Kawada Kogyo was founded in 1959, when Japan got out of the post-war turmoil and completed the Tokyo Tower and the first 10,000 yen bill. The main concept of the company is Geo Engineering-Engineering for the Earth. Regarding what Kawata Engineering Corporation is going, it is said by the company: "The goal is "engineering to achieve coexistence with the rich earth." The business fields of “Architectural” and “Civil Engineering” that we at Kawada Kogyo are working on are rooted in the earth. In other words, it would not be possible without this earth. Therefore, we want to remain sensitive to the richness of the earth. And, we want to create the foundation of people's lives and to protect the richness of the earth as well as the engineering we demonstrate."